The answer is; Yes, of course it matters, but it isn’t helping your marketing. Word-of-mouth and online review websites are the dominant resources patients use to select their healthcare practitioners. Which means that in 2017, taking charge of your online and offline reputation management isn’t optional, its essential! Following these steps will put you on the fast track to a positive reputation that attracts the new patients you want. 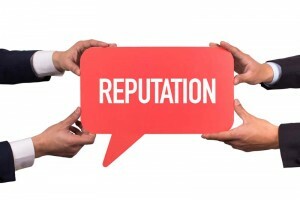 Before you pursue ratings, reviews, referrals or any other sources of feedback, it’s important to establish a foundation for your online and offline reputation. Without a solid foundation, you’ll always feel like you’re plugging holes and bailing water, instead of sailing. Office conditionsYour office aesthetics and amenities affect your patients’ moods and spark their first impression of you. Once you begin soliciting online reviews you don’t want to see “disgusting bathroom” or “worn-out furniture” anywhere near your name. Hire an interior designer and a cleaning crew. Offer free WiFi and coffee/cold drinks. Not only will your patients appreciate and remember it, but your staff will also feel more comfortable and friendly. Staff friendliness A patient’s interpersonal experience with your practice can sway his or her overall opinion. This makes friendly staff members, especially the front desk team indispensable. Hire well, create an enjoyable work environment, treat everybody as an equal and don’t be afraid to pay for talent, you’ll see the return. Wait times If you can avoid it, don’t pack your schedule. When visiting a healthcare practitioner’s office, patients tend to expect long wait times. But that doesn’t make waiting any less irritating. Demonstrate respect for your patients’ time by being on time, doing so will distinguish you and your practice before you even walk in to greet them. Online profilesGoogle+, Facebook, LinkedIn and more. Whether you like them or not, online profiles are important tools for distributing your brand and capturing patient reviews. While tedious, claiming your profiles will help prospective patients feel like they’re seeing an established, credible practice provider. Finally, make sure all addresses and phone numbers are correct, especially if you’ve recently changed offices. Do not skip this step. Optimising these basic aspects of your practice is necessary to generate consistent positive reviews and patient referrals. If any of the above factors are substandard, it can overshadow even the most brilliant practitioners. Finally, managing your reputation is a team endeavour. Much like hiring the perfect person for your front desk, you’ll need the proper person to monitor your online presence. Practitioners don’t usually have the time to patrol their own profiles, so give your reputation management the attention it deserves by hiring and delegating appropriately.